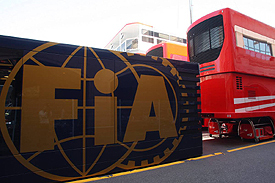 The FIA has blamed factions within the Formula One Teams' Association (FOTA) for the failure of the two parties to reach agreement on the future of the sport, following the announcement that there will be a rival series next year. The eight members of FOTA met at Renault's Enstone factory on Thursday night to discuss their response to the Friday deadline to lift conditions attached to their entries for the 2010 championship. After deciding they could not accept what had been put on the table for them by FIA president Max Mosley, the teams confirmed that they would be setting up a breakaway championship in 2010. The FIA has responded by expressing its disappointment about the decision, and says that some elements with FOTA had always tried to scupper a deal. "The FIA is disappointed but not surprised by FOTA's inability to reach a compromise in the best interests of the sport," said the statement. "It is clear that elements within FOTA have sought this outcome throughout the prolonged period of negotiation and have not engaged in the discussions in good faith. "The FIA cannot permit a financial arms race in the championship nor can the FIA allow FOTA to dictate the rules of Formula 1." The FIA says that its deadline for teams to lodge unconditional entries will remain as the close of business today, with the full 2010 entry list to be announced on Saturday. "The deadline for unconditional entries to the 2010 FIA Formula World Championship will expire this evening," it said. "The 2010 FIA Formula One World Championship entry list will be announced tomorrow."